Advertisers can now curate the Moments you see, starting this weekend. Twitter has a team of curators working to bring you the best, most relevant tweets of the day as part of its new feature, Moments. The new tab rolled out two weeks ago as an ad-free experience, but that bliss was short-lived—now brands can be curators, too, with the test launch of Promoted Moments. Unlike Promoted Tweets, app install prompts, and other forms of advertising on Twitter, Promoted Moments won’t clog up your timeline with content you don’t want to see. Advertisers will have a dedicated channel for 24 hours within the Moments tab, where they can curate tweets, photos, videos, Vines, and news articles related to whatever they want to promote. 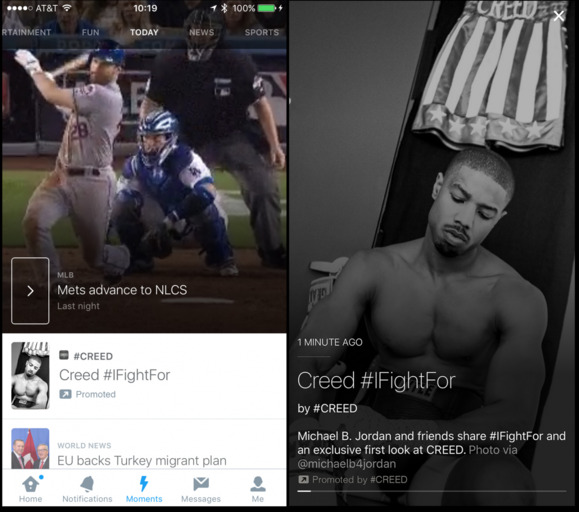 The first Promoted Moment is a campaign blitz for the new movie Creed and will appear on Sunday. There will only be one Promoted Moment per day, Bloomberg reported, so you won’t have to wade through a ton of ads to see the Moments you want to see. And you’ll know a Promoted Moment when you see it—it will be marked with a badge.